In the past ten years, an enormous amount of ambition and energy has been concentrated on the planning, design, and building of New York. From megaprojects such as the World Trade Center, Hudson Yards, and Atlantic Yards to the rezoning of 8,400 blocks to the creation of the largest parks since Central Park, the scope of change proposed for the city has been astonishing. Much of the discussion and debate during this period has coalesced around individual projects and initiatives, with less consideration of how they might combine to create a new New York. This timeline is a first effort at bringing together in one chronological narrative the major projects and proposals of the past ten years so that we can better understand what their collective impact on the city might be. The complexities of planning and building in New York are enormous and can be understood and interpreted in a multitude of ways. This timeline makes no claims to being comprehensive. 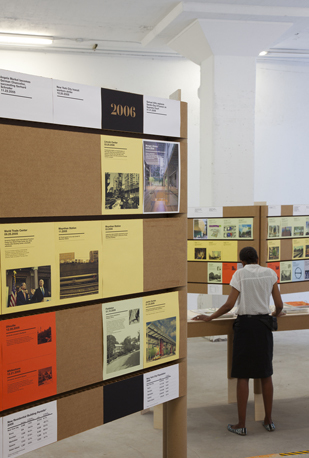 Rather, in limited space it attempts to highlight important moments of design proposition for a range of major projects and the key events along the way that helped shape them, from the first announcement of a new development to the unveiling of design proposals to the opening of completed buildings in some cases and cancellation in others. It is a graphic reminder of the remarkable trajectory of the making of the physical city over the past decade, revealing connections across time and space that only hindsight makes possible. The timeline uses a pair of simple organizing frameworks. The first is a set of three horizontal bands that articulate the kinds of actors that shape the physical city, from state and city governments, to private developers, non-profit organizations, and community activists. The horizontal bands represent a spectrum of activity ranging from PRIVATE at the top to PUBLIC on the bottom, with the middle band representing the blurred boundaries where public and private sectors intersect and act in concert. The second organizing framework is a system of colors that differentiate projects and processes by type of activity: Plans/Initiatives; Zoning; Preservation; Buildings; Parks/Recreation/ Waterfront; Infrastructure/Public Works; and, finally, Megaprojects (more below). Together, the organizing frameworks form a matrix that reveals patterns of activity and helps explain the different processes by which the city is imagined and made. A great deal of change to the physical city starts with a plan or is shaped by an initiative that rethinks existing patterns of activity. Often such plans and initiatives are created by public agencies, but they can also be proposed by non-profit organizations or even through grassroots efforts by community activists. Timeline entries present a selection of some of the most significant plans and initiatives proposed by the city and community groups, addressing a diverse set of issues that range in scale from the design of new bicycle racks to the amount and distribution of affordable housing throughout the city. Also included among these entries are significant citywide analyses of emerging trends or the impact of previously instituted plans. Zoning is a set of regulations used by the city government to determine, among other things, the size and shape of buildings. It also regulates the uses of land, whether for residential, commercial, industrial, recreational, or a mix of these uses. Administered by the Department of City Planning, zoning is an extremely powerful tool that shapes the density and character of the city. The current zoning resolution in New York City was enacted in 1961, replacing the original resolution that was passed in 1916. Changes to the zoning resolution can be initiated by the city or they can be requested by private developers or other groups for specific development sites, most commonly to allow for larger buildings or for changes in land use. In its first two terms, the Bloomberg Administration undertook one hundred rezonings affecting more than 8,400 blocks, more than any previous administration. Timeline entries present information about these and selected other changes to the zoning resolution enacted since 2001. From the thousands of buildings that were built in the city over the past ten years, the timeline presents a cross-section of what new architecture in the city looks like. Buildings were selected based on a number of criteria that included design innovation and ambition. Each building on its own had a notable impact on the neighborhood or community in which it was built or proposed, and contributes in some way to the public conversation about architecture and design in New York. The buildings as a group should not be interpreted as a definitive list of the best new buildings of the decade, although many are among the most significant examples of new architecture the city has seen in a generation. Many other important buildings are represented elsewhere as part of other categories on this timeline. Timeline entries present buildings by private clients, including developers and cultural or educational organizations. Entries also include a selection of projects commissioned by the Bloomberg Administration’s Design and Construction Excellence Program that seeks to elevate the level of design quality in public projects. Projects represent a range of building typologies, from firehouses to luxury condominiums. Some are built while others are still in the development or proposal stage. Timeline dates represent the completion date for projects that were built and the proposal date for projects that are in development or construction, or for projects that were proposed but subsequently cancelled. The New York City Landmarks Preservation Commission is the city agency that designates and regulates New York’s historic landmarks and districts, which include 1,128 individual landmarks and more than 22,000 properties in 94 historic districts. Once a building is landmarked, the Landmarks Preservation Commission must approve any changes made to it by its owner. This also applies to all buildings within a historic district. Preservation in New York is also shaped by a long list of committed individuals and organizations that advocate for and watch over the city’s historic fabric. Since 2001, the Landmarks Preservation Commission and the City Council have designated 31 new historic districts throughout the city, bringing the total to 94. Timeline entries present these new districts, as well as a range of development projects or proposals that either fell under the jurisdiction of the Landmarks Preservation Commission or became rallying points for preservation organizations and advocates. New York City operates a system of more than 1,700 parks comprising 28,000 acres; 2,100 Greenstreet sites; 990 playgrounds; 800 athletic fields; 13 golf courses; and 14 miles of beach. Additionally, the city has 578 miles of waterfront, giving it 17% of the state’s entire coastline. In the past ten years, the city has undertaken dramatic additions to or rehabilitations of its parks and waterfront. Among the many new parks built or under construction in the city, several are among largest in the city’s history. Timeline entries present these new parks, as well as a selection of smaller parks that have significantly affected their local communities. Infrastructure and public works are large-scale systems that service the city and are vital for its efficient operation, including transportation systems, energy grids, water treatment facilities, and waste removal services, among others. Timeline entries present a selection of the most significant infrastructure projects in New York of the past ten years, including major new or rehabilitated train stations, subway extensions and renovations, and other infrastructure facilities and initiatives. There is no precise definition of what a megaproject is. Typically, they cost hundreds of millions, if not billions, of dollars. They are of an urban scale, substantially affecting local communities. They are often mixed-use in purpose, including residential, commercial, and recreational components. They can also require significant investment in infrastructure. The images and material presented on this timeline have been provided by the architects or clients of the projects described, gathered through contemporary news reports, or are to the best of our knowledge, in the public domain. If you find any material that is improperly attributed, please email nny@archleague.org and we will correct the error immediately. Individual building projects are listed in the year the project was completed; unbuilt projects are listed in the year the commission began. For zonings, the date given is the day on which the City Council voted to approve the rezoning. Similarly, dates given for the historic district designations are the date of the City Council approval. Dates given for other projects are typically the date of the specific event described in the timeline entry. Exhibition installation, 250 Hudson Street. Photo: David Sundberg/Esto. All rights reserved.